At The State Credit Union, our goal, quite simply, is to minimize your exposure to risk and the impact of any fraudulent activity on your accounts. To protect your account, The State Credit Union monitors debit card transactions for potentially fraudulent activity through a Fraud Detection Program called EnFact Premium Testing. Potentially fraudulent activity may include a sudden change in locale (such as when a U.S. issued card is used unexpectedly overseas or in a foreign country), a sudden string of costly purchases, or any pattern associated with new fraud trends around the world. If fraudulent debit card use is suspected on your account and we can't reach you by text message, you will be called to validate the legitimacy of your transactions. Your participation in responding to our call is critical to prevent potential risk and avoid restrictions we may place on the use of your debit card. Our call center will ask you to verify recent transaction activity on your card. You'll be asked to verify your identity. It is the policy of The State Credit Union to NEVER solicit customer information or identification, numbers or passwords via e-mail. If you are approached with such an offer, do not reply to the e-mail and instead contact The State Credit Union immediately. to the left and let us work for you! 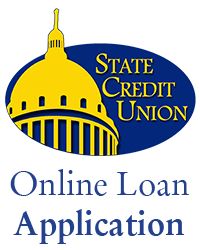 Apply online today for a State Credit Union Credit Card! From time to time, people changes jobs, houses, telephone numbers or just their email address. Please remember to let the State Credit Union know about your changes so we can ensure we contact you at the right address/email/telephone and also keep our records up to date. Due to the volume of 'Returned Statements' by the U.S. Postal Service, the pre-established $10 fee per statement will be implemented, and charged for each statement returned to SCU. E-statements are a popular option for members in lieu of receiving a mailed statement. To make this change, contact the Credit Union or simply go to SCU on Web, click e-statements, Enroll now, and confirm the agreement. Also, any changes can be made directly on the SCU on Web. This method is safe and secure and can be completed on your time. Thanks for being a State Credit Union Member! You have a 'balance' and an 'available balance' amount. The 'available' amount is the amount you have access to. The debit card 'Authorization Holds' or amounts are removed from you balance to show your available amount to use. This is important to recognize in managing your daily transactions to avoid (NSF)-Non Sufficient Fund charges. Debit Card Users Traveling Outside The U.S.A. Call us before you travel outside the United States Due to increased fraud your transactions may be blocked without preauthorization. This restriction is for your protection as well as ours and we apologize for any inconvenience. Reminder, if you have not made a transaction (deposit or withdrawal) to your account within a year, now is a good time to do so. This will keep your account active and out of dormant status.